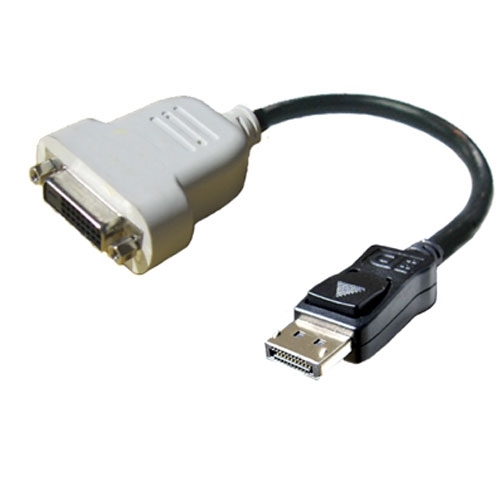 The Display Port-to-DVI Adapter from Dell converts a DisplayPort computer output to DVI. The adapter supports uncompressed High-Definition digital video up to 1080p and up to 1920x1200 computers resolution to give you clear and high quality images. Additionally, it boasts a flexible 10-inch design with good bending radius to ease cable management. Featuring DisplayPort Content Protection (DPCP) and High-Definition Content Protection (HDCP), this adapter offers an ideal solution for your secured connectivity needs. This product has been tested and validated on Dell systems and is supported by Dell Technical Support when used with a Dell system.